I'll be really honest. When it comes to the abortion discussion, I've never been a real fan of the "A woman has the right to choose what to do with her body" discussion. While I agree in theory with that statement, I don't find it particularly relevant to the discussion about abortion. See, the way I see it (and I know this will identify me as one of "those"), once a woman is pregnant, she's already made her choice of what to do with her body. I try to keep this blog family-friendly, so I won't say more than that. But you see what I'm sayin'. When Ole the Swede chooses to be a Lumberjack, he recognizes that a very possible result will be some type of chainsaw disfigurement at some time. When Muskegon Mark chooses to work at the Paper Mill, he understands that he may well lose a finger in one of the paper machines. When Jimmy Johnson climbs into one of his left-turn-only cars, he realizes that a fiery crash may be awaiting him. When we make a choice, knowing the possible consequences, we really can't logically complain with the consequences befall us. Maybe the marital act should come with a waiver or something, but that would be hard to enforce. When a woman finds herself "with child", in most cases, she really has no one to blame but herself (I know there are exceptions and contributing factors). So it's a little disingenuous to try the ol' "I should be allowed to do what I want with my body." The truth is, she (and HE) already did. If anyone, ever, in human history had a legitimate argument to say, "This is my body, and I don't want to be pregnant!" It was a young girl in Luke 1. We know her as Mary. Her pregnancy had ABSOLUTELY NOTHING to do with any choice she had ever made. In no way was it a consequence (either direct or indirect) of any action she had ever taken. And yet, she was pregnant. For Mary, this was likely a much greater inconvenience than it ever is now. After all, in those days, they still stoned young girls who got pregnant outside of marriage. So, when the angel told her that she was going to pregnant, no one would have been surprised if she had said, "Can I not?" But Mary didn't say, "No". Instead her response is shocking and insightful. She said first "I am the servant of the Lord." She saw this child (which she hadn't done anything to receive) as a responsibility she had been given from her master. Secondly, she said, "Let it be to me according to your word." She completely gave up control of her life and determined to righteously live out the hand God had dealt her. I wouldn't ask someone who didn't believe in God to respond this way. But I really wonder if those who claim a belief in God or the Scriptures or Jesus can look at the story or Mary and come away without at least a question of whether or not there's a better way than "It's my body, I can cry if I want to..."
There's definitely more to say and think about this, but I'll leave this one open-ended and trust that some of you will have more to add. Are the needs of the community met? The manner in which a church stewards its resources (lets be honest, the building is usually a big one), particularly in regards to the external community, says a lot about its generosity level. What's the EQ? - Every church has an "entitlement quotient" that mirrors the generosity level of the congregation. One way to gauge EQ is to measure how often "I", "my", and "mine" appear in conversations. Are the needs of the pastors met? Sure, this feels self-serving; but I'll bet most pastors could tell you pretty easily (if they were willing to be honest) whether or not they feel that their church invests in their well-being. Are the needs of outsiders met? A generous church is a wonderful church to visit. How people feel after they visit a church gathering for the first time is a super indicator of the church's generosity level. A sower went out to sow. And as he sowed, some seeds fell along the path, and the birds came and devoured them. Other seeds fell on rocky ground, where they did not have much soil, and immediately they sprang up, since they had no depth of soil, but when the sun rose they were scorched. And since they had no root, they withered away. Other seeds fell among thorns, and the thorns grew up and choked them. Other seeds fell on good soil and produced grain, some a hundredfold, some sixty, some thirty. The rocky ground began to make noise. The large stones and the small pebbles began to cry out to the sower. "You haven't given us enough time!" they said. If only you would put more dark soil around us, our seeds would grow. So the sower went to the store and purchased more soil and placed it around the rocks. Again the seeds immediately sprang up, but it still had no depth of soil, and when the sun rose they were scorched again. And then another strange thing happened. The thorns began to make noise. "It's not our fault that the seeds didn't grow" they said. "You planted the wrong kind of seed. The old sower used a 'thorn-friendly' seed, and it grew just fine here." The sower sighed, the thorns continued, "If you'd just plant seed that worked with us, we'd give you a great crop!" So the sower went back to the store and purchased "thorn-friendly" seeds and sowed them among the thorns. But when the seeds began to grow, the thorns grew up and choked them again. And then the sower realized, he had no more time to tend to the good soil. And the field was lost. She does. God miraculously keeps her food supply from running out until the famine is over. What I like particularly in this story is the initial interaction between Elijah and the widow. When he asks her to provide him with a meal, she replies, "As the LORD your God lives, I have nothing baked, only a handful of flour in a jar and a little oil in a jug. And now I am gathering a couple sticks that I may go in and prepare it for my myself and my son, that we may eat it and die." She's very matter-of-fact. "We're going to eat this last meal. And then we're going to starve to death." She's accepted the inevitable. She's come to grips with how this story is going to end. She's lost all hope. But Elijah suggests that the story may not quite be over. He says, "The jar of flour shall not be spent and the jug of oil shall not be empty, until the day that the LORD sends rain upon the earth." In other words, he tells her that the story isn't going to end the way she thinks it is. God's agenda is different than hers. God always does that which will bring glory to Himself. In bringing glory to Himself, God always does what is best for us and what will meet our needs. God often works out His agenda in ways we might not expect. God usually works out His agenda in timing we would not choose. The story almost never ends the way we think it is going to. While we may not always have a Zarephath kind of moment (sometimes God's timing is vastly different than ours), we can rest and be comforted that whatever God is doing in the moment is intricately connected to what He will be doing in 5 weeks, 5 months, 5 years, even 5 decades. Our hope is not in the expectation that we will get what we want in this moment, but rather our hope is that we will receive all that we need both now and in the days to come, but especially when our adoption is made complete at the end of time. I'm convinced that we're all idolaters. The last verse of 1 John says, "Little children, keep yourself from idols." This seems to be a strange way to end a letter that didn't really address idolatry at all. My opinion is that John realized how easily and quickly idolatry can creep into our lives and our churches. I don't think he was terribly concerned about the Christians turning to worship of Baal or Ra or Dagon. I don't think he was concerned about them carving fish-like ducks out of wood and then bowing down to them. I think he was concerned with the subtle, every-day idols that sneak into our lives and take our priorities away from God. The idol of walking in darkness (keeping our sin hidden rather than confessing it). The idol of false security (basing our salvation on a prayer rather than faith). The idol of squeamish theology. The idol of pet-sins (habitual sins). The idol of brotherly hatred. The idol of whatever gets between us and God. There's lots more in this book, but these ten are a start. "How do you measure success?" 8 is the perfect score, meaning you are very spiritual. Of course you could apply a bonus formula to gain two extra bonus points if you wanted. Those two points could come in very handy if you fell short of 8, or if you wanted to be elected to a committee during the annual fall elections. A score higher than 8 virtually assured you a spot on the committee of your choice. If you grew up in a church like mine, this is all old hat to you. You've seen these equations many times before: on overhead projectors, flannel-graph boards, and maybe if your church was high tech, via slide projector. SQ is "Spiritual Quotient". This is your level of spiritual maturity. Of course, BSQ is "Bonus Spiritual Quotient". SUa is Sunday morning attendance. TUv is Tuesday Visitation attendance. Add up all your Sunday morning and Tuesday evening participation over the course of a year, and divide that number by 26. SUp is Sunday evening attendance. WEP is Wednesday evening prayer meeting. Again, add up all your participation over the course of the year, and divide this number by 52. Bonus points for using a King James Version Bible and for calling yourself a Baptist. 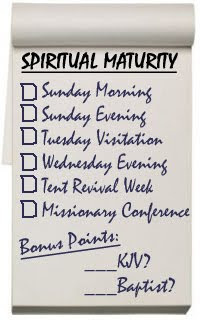 This process of determining spiritual maturity makes things very easy. You can quickly determine who is the most spiritual person in your church, as well as those who probably need to sit closer to the front on Sundays. Deacons and Elders can use these formulas to carry out church discipline and Sunday School Teachers could regularly have their students work out their own scores to inspire them to do better in the coming months. But seriously. Too often people have the idea that Christianity is just about checking off the right boxes. And if you attend all the right things at the right times, then you're going to come out all right on God's scorecard. I call this, "Discipleship by Attendance". Marianne and I were talking tonight about how difficult it is for some people to shift out of this way of thinking. Particularly if they were reared in a church which emphasized attendance as the primary means of spiritual growth. It took me years to shake loose from this kind of thinking, which too often exhibited itself in my life when I judged others for their lack of attendance at "church stuff." My assumption was that their non-presence represented a spiritual immaturity. Little did I know that my judgement on them for their non-presence represented a much deeper level of spiritual immaturity. So now, when I get asked how I measure success in discipleship... I sigh deeply and then hem and haw about how it's hard to measure the work of the Spirit. I mention the parable of the sower and the soils and point out that sometimes initial growth is false growth. I talk about Galatians 5 and explain that the fruit in ones life being a dashboard to measure by, but not a checklist to live by. And I keep talking about lots of stuff like that until they're sorry they asked. But I don't really ever talk about measuring success... Because I'm pretty sure as one who doesn't sit on a throne and won't be presiding over any judgments at the end that that's not my job. Seeking to constantly share the message of Christ and show the mission of Christ. I know at first glance this kind of list doesn't seem to be any different than the ones I joked about. But, in my mind at least, this list is far less about the actual "doing" and far more about the actual "being." Any time we try to put "being" type concepts into words we run the risk of slipping into the Pharisaical legalism of "maturity by list", so we need to be careful even with a list like this. But in the end, the main idea is simple. The more we look like Jesus (the revealed, biblical Jesus who is the image of the Father; not like some Jesus that we made up) the more spiritually mature we are. Numbers can never tell an accurate story of a church's success. To assess a church, a group or a ministry's level of success or failure with any type of numerical measure is to impose upon the church an institutional criteria and burden never discussed in the New Testament. The successful church, the successful ministry or group within a church, and the successful Christian is the one who is faithful, not the one who is large or rich. Faithfulness for a church, for a ministry or group within a church, or for an individual believer is measured in obedience and worship. By obedience, I mean striving to be and do what Scripture has clearly prescribed; and trying to accurately determine and live out what Scripture has implied. A) True obedience is an act of worship. B) Worship without obedience is disgusting to God. By worship, I mean utilizing every resource available to appropriately revere and represent God. Church people often ask questions like, "How many small groups do we have?" or "How many people are in small groups at our church?". While most pastors could, with a minor amount of effort, know the answers... those might actually be the wrong questions. "How are our spiritual formation efforts enabling people to live lives obedient to God?" "How are our spiritual formation efforts equipping people to worship God with all the resources He has given them."